Data Browser is a WYSIWYG GUI for adding, modifying and viewing your appbase.io app’s data. Data is stored as JSON documents in a type. You can read more about the data schema here. used as a hosted app here. You can go to the appbase.io dashboard and create an app. In the below gif, we create an app called newstreamingapp. You can access the databrowser from the dashboard or independently via dejavu app. Follow the above steps to add your first data. 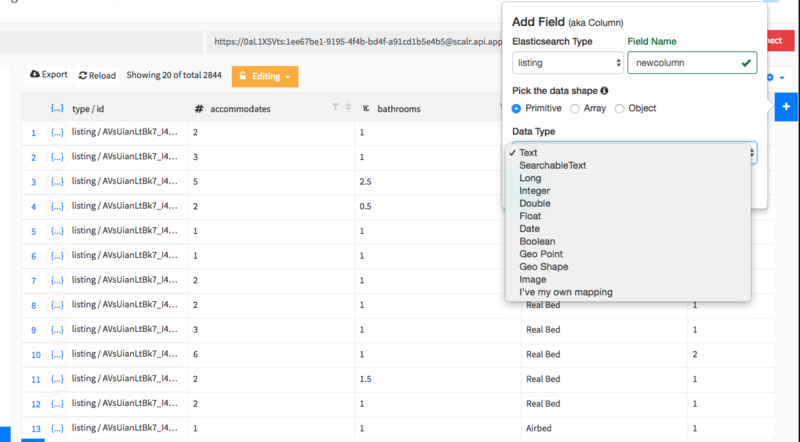 Dejavu now also supports adding new fields, including setting the appropriate mappings for the field. You have to first be in the Editing mode. And then select the + button near the field name headers in the column display on the top right. You can pick from the one of the available data types or set your own mapping. The data browser allows adding data as a single JSON object or multiple JSON objects (passed as an array). It is recommended to pass up to 100 objects at a time. Existing data records can be updated easily. Select a record from the view and tap the Update button. Data records can also be deleted easily. Select a record (or multiple) from the view and tap the Delete button. 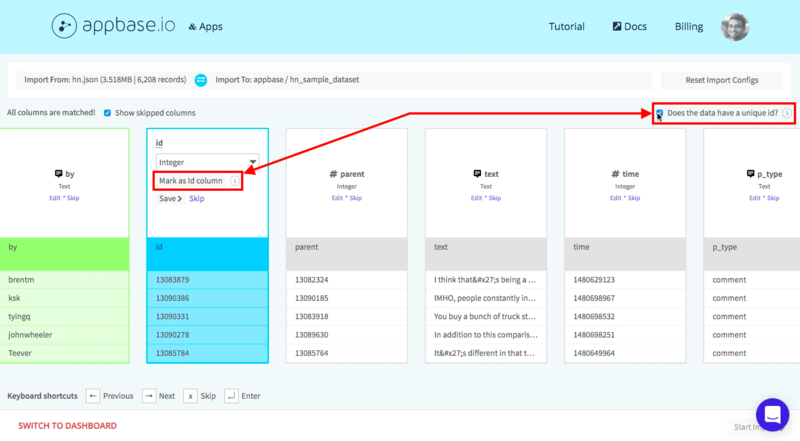 You can directly import JSON or CSV data files into appbase.io using the data import functionality. 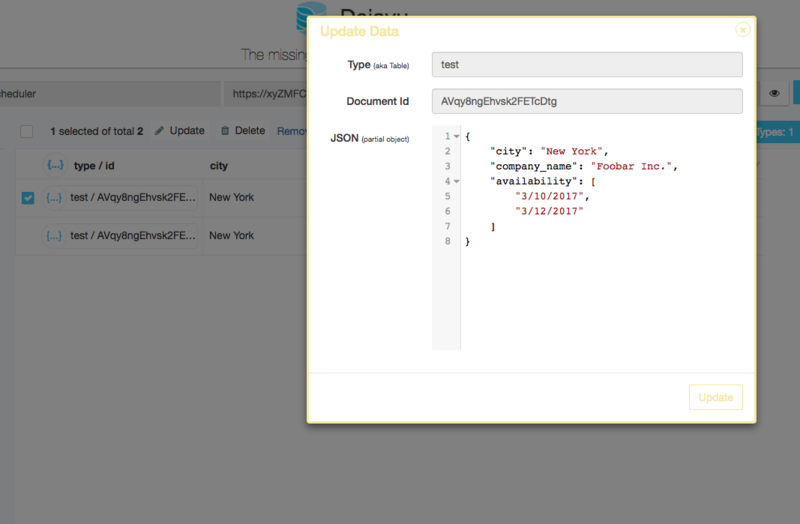 Here is an example showing import of a JSON file when creating a new app. The import view lets you set the data mappings via a GUI and index data. Currently, it supports up to 100,000 records at a time (or up to 100 MB of data). Once your data is imported, you can view the data via the browser view. When importing a frequently changing dataset, we recommend setting a Unique Id field. This can be enabled by selecting the checkbox for “Does the data have unique id?” question followed by selecting an id column (a Mark as Id column label should appear in the active column). Setting a Unique Id column ensures that your dataset doesn’t create duplicate documents across re-imports. When is it a good idea to use this feature? Do you frequently update existing documents? Are you importing data from another data source (e.g. MongoDB, Google Analytics) where you already have a unique Id column? Do you plan to interact with the imported data via code? Do you have more than 1,000 documents? You don’t need to use this feature if your documents are never the same or if you are dealing with a very small set of documents. The expected shape for the JSON file is an Array of document objects. If you are importing a CSV file, we treat the first row as the column headers row. Spaces and/or special characters used in field names are automatically replaced with acceptable characters in the import view. To set a null value in a specific cell, either leave the cell as empty or explicitly use the null keyword. Column names ending with lat and lon are automatically detected to be of Geopoint datatype. Setting a nested field from a CSV file requires using a dot notation, e.g. nested_field.a and nested_field.b column names will be imported as sibling fields a and b within the nested_field field. The data browser is still a great place to import, visualize and debug the existing data records with its filters and continuous query functionalities.